Is your brand feeling outdated? Do you need to differentiate from competition? Or are you looking to reach a new target audience? A Brand Positioning Sprint is tailored to engage your target audience in a series of activities designed to get you deep insights on your brand positioning. Understand how your brand resonates with consumers, identify competitive differentiations, test new concepts and optimize your brand's core messaging. Digsite participants use a combination of discussion, photo/video uploads, survey responses, voting, and image mark-up activities to optimize your brand positioning. After more than 14 years without any communication, Dannon's flagship brand, Dannon Fruit on the Bottom, was seen as "Boring and outdated," by consumers. 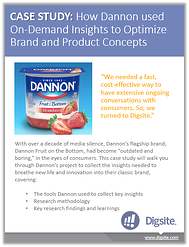 In order to breathe new life into this brand, Dannon needed to first needed to understand how consumers currently viewed brand Dannon, what they now looked for in yogurt brands and how best to communicate with them. See how Dannon was able to collect the insights they needed to give life to the first national advertising campaign in over a decade for their flagship brand.